Found 2 file extension associations related to Business Intelligence Development Studio and 2 file formats developed specifically for use with Business Intelligence Development Studio. 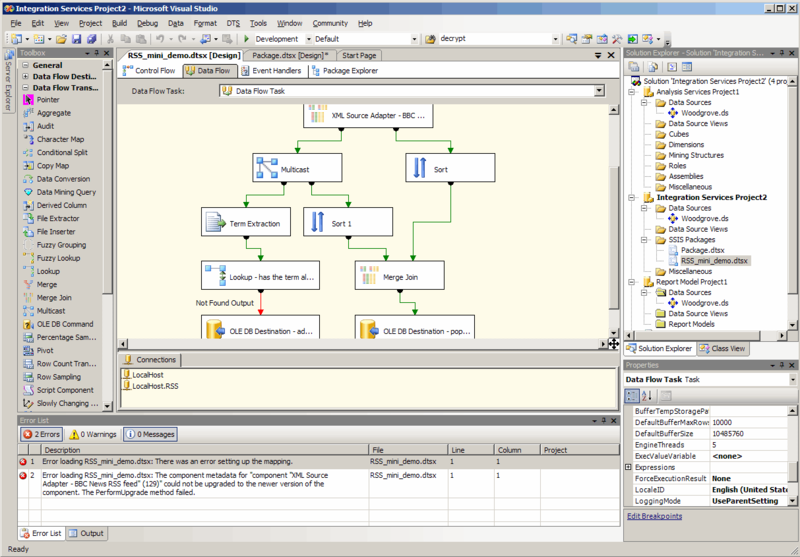 Business Intelligence Development Studio is Microsoft Visual Studio 2008 with additional project types that are specific to SQL Server business intelligence. Business Intelligence Development Studio is the primary environment that you will use to develop business solutions that include Analysis Services, Integration Services, and Reporting Services projects. Each project type supplies templates for creating the objects required for business intelligence solutions, and provides a variety of designers, tools, and wizards to work with the objects. Microsoft Visual Studio 2010 does not support Business Intelligence Development Studio Integration Services, Report Services and Analysis Services projects for SQL Server 2008 and SQL Server 2008 R2. To work around this issue, you can install Visual Studio 2008 alongside Visual Studio 2010 on the same machine and then open the Business Intelligence Development Studio projects in Visual Studio 2008. If you need more information please contact the developers of Business Intelligence Development Studio (Microsoft Corporation), or check out their product website.